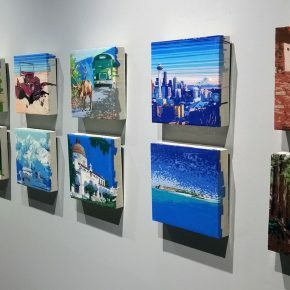 One of the unique opportunities found within the arts is the ability to connect the dots between seemingly unrelated objects, methods, and concepts. 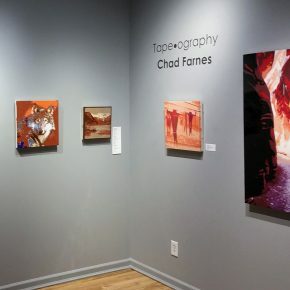 Chad Farnes’ work makes an effort to bring all three to the forefront in his presentation of Tape•ography, a collection of landscapes created using various forms of tape, especially duct and masking tape. A far cry from the typical glossy gray that duct tape brings to mind, the work is vibrantly and fancifully colored. Mountains and trees become illuminated, taking on a dreamlike quality and drawing us in to each scene. The tape itself is torn and cut into intricate mosaics, layered many times over and ultimately coated in thick clear varnish, creating a ceramic aesthetic and causing the viewer to momentarily forget the underlying method. This push and pull between the materials and the, at times, majestic landscape are at the heart of Farnes’ work. “Tape, to many, may seem meaningless and inconsequential, but when used and preserved with correct techniques, it can create fascinating, beautiful images,” says Farnes. The tape, carefully preserved and put on display, ultimately becomes a metaphor for the scenes it depicts—the Utah National Parks. Farnes argues that the parks, like the tape, are not valued as they should be and unless carefully preserved will be lost. The work becomes a gateway to a greater conversation about the parks themselves; a conversation that continues long after one leaves the gallery. Rather than focus solely on the work, we are reminded through these images of the greater world outside the gallery. This is emphasized further by the mountains that greet us as we leave Finch Lane and one can’t help but compare the representation of the mountains just viewed to the natural beauty before us. Farnes emphasizes the need that we have for this awareness, stating, “My goal…is to explore the intersection between humanity and federal land preservation…What is preserved with [the] creation of a national park?” The concept of land preservation itself is enhanced, perhaps even ultimately dependent, on the personal connection we share to it. Farnes attempts here to bridge that gap for us, calling to us with common tools to see something and, hopefully, feel something more. 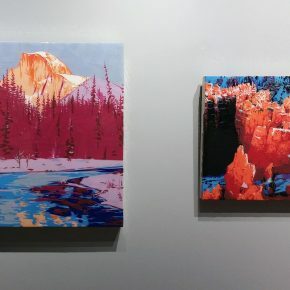 For Farnes, the success of the work seems to be that conversation and the hope that the ideas presented will be taken far beyond the gallery and, more specifically, to the lawmakers who control the use of Utah’s land. Asking again the question, “What exactly is preserved with the creation of a national park?” we are further guided, “Is it simply to protect an endangered species or a spectacular vista… Or is the purpose of national parks to preserve the wild that exists in each of us that could not be explored?” Visit the Finch Lane Gallery and find the “wild” in yourself. 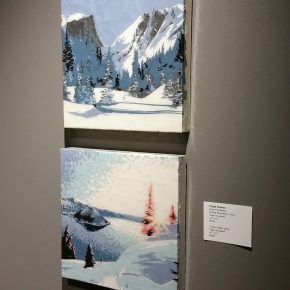 Finch Lane Gallery, 54 Finch Lane in Reservoir Park, 1340 E. 100 South, Salt Lake City, presents works of Chad Farnes, Kristina Lenzi and Darryl Erdmann in exhibitions running through Nov. 20. Artists will give gallery talks Oct. 13 from 7-8 p.m. Hours are Mon.-Fri: 9 a.m.-5 p.m. and Gallery Stroll Oct. 16 and Nov. 20 6-9 p.m. Info: 801-596-5000. There’s a division of the Smithsonian that has the undesirable task of attempting to remove tape and related materials from priceless bits of our heritage. At some point, some amateur wishing to preserve, or at least prolong the life of a piece of history tapes it to hold it together. Soon the tape becomes a far worse threat to the survival of the heirloom and must be removed, somehow without destroying it. I enjoy, and enjoy writing about, David Habben’s art, but I disagree with him that we undervalue tape. Most of us would only part with our live-saving tape when it was peeled off our sticky, paper-cut bleeding fingers. Because we far over-value it we don’t realize that it’s not a permanent solution. Gray Haertig identifies two items in a craftsman’s kit: materials and tools. A tube of paint is a material, meant to be a permanent part of the job. 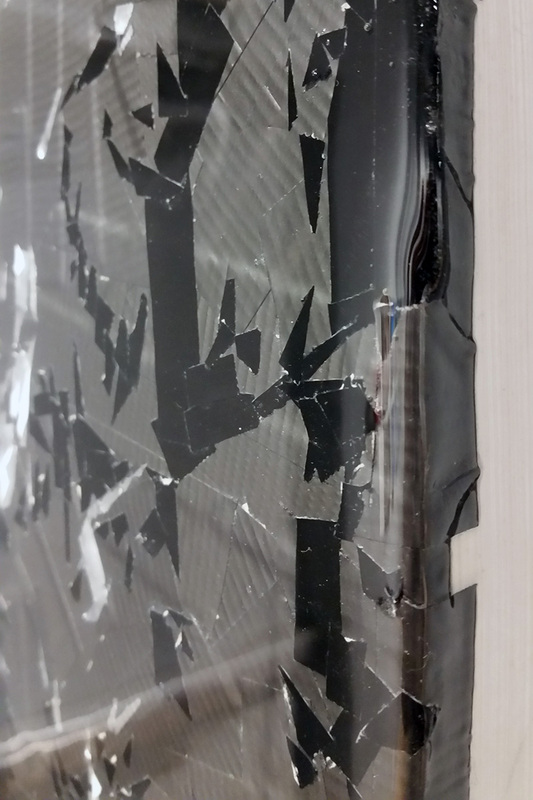 Tape is a tool, meant to be used and, when done, taken out with the trash. 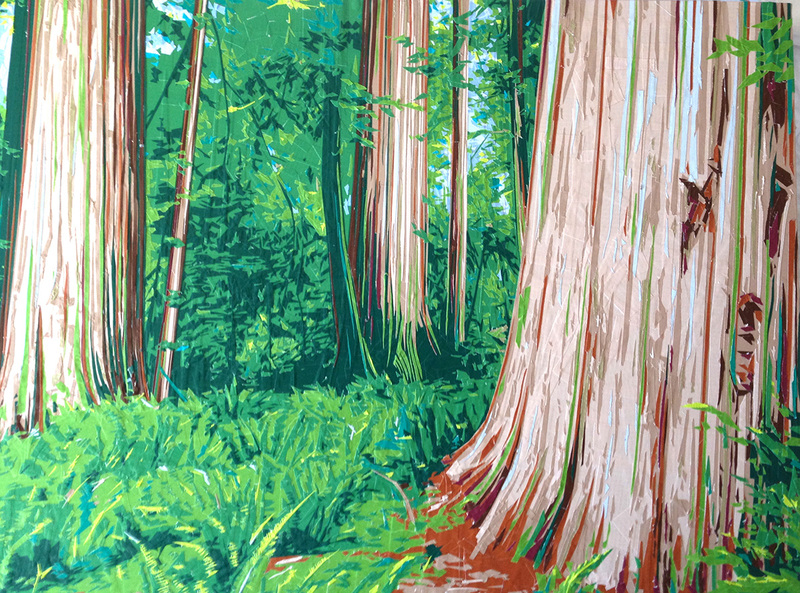 To use tape to duplicate trashy cliché images of nature is a stunt that honors neither nature nor art. I, myself, am very interested to see Farnes’ exhibit based on David Habben’s fine article and the art that accompanies it. Looks fascinating. And there’s Lenzi and Erdmann, too! How can one miss this? Ann, I wouldn’t dream of suggesting anyone NOT look at this work. I hope everyone goes to see it, and welcome responses that fairly address my points. Criticism should never be censorship.